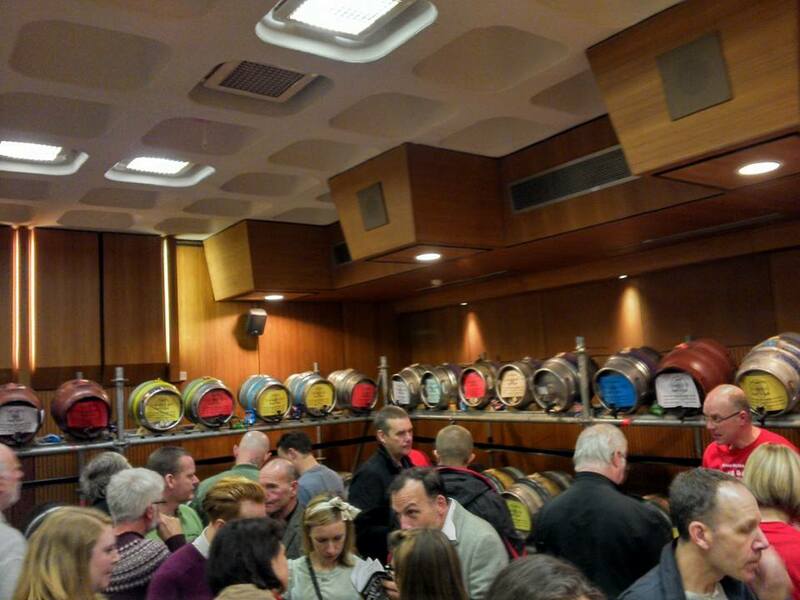 The annual Sussex CAMRA Branches Beer & Cider Festival (to be formal) is a big deal for the Sussex beer drinker and a must for the calendar, with over one hundred brewers showcasing hundreds of beers over the course of four days. It’s the Glastonbury of Sussex beer fests -they even have a face-painting stall. The anticipation of this event is high, akin to being a kid at Christmas (for me and my beery band of mates anyways) and this year didn’t fail to deliver. Many of the brews that I had ear-marked for my Saturday afternoon session had already been enjoyed by others to the point of sell-out but it wasn’t difficult to find magnificent beers to sample. I chose my glass, bought my tokens, picked up a programme, entered the main hall and set about picking my first third of the day. I opted for a black IPA (time for you to squirm Mr. Protz) by the name of Black Jesus by Great Heck. The name caught my eye first, nobody was buzzing around this corner yet and crucially, it was still available. And by- heck it was good. Described as having ‘biblical quantities of premium American hops and special dehusked German roasted malt’, this coal-black, 5% IPA had orange, grapefruit, floral and roasted malt notes on the nose whilst the palate was full of smooth orange-juice notes that coated the mouth, making way for big, bitter grapefruit and pine hits and rich, almost smokey roasted malt as a platform for them to play on. An epic IPA and a real highlight of the day. Next up was another 5% IPA- Worm Catcher by Late Knights brewery. This was to be another highlight of the day for me, proving that my tastes really have changed- this time last year I was avoiding heavy-hopped beers but now I can’t get enough! Described as being a ‘double-hopped IPA; very hoppy courtesy of Columbus, Cascade and Cluster hops’. Orange dominates the aroma with the palate playing host to a real earthy quality (without the worms) among the earthy notes there are biscuit malts underneath sticky orange marmalade and pine, with citrus pith bitterness especially in the finish. With all good things, the early bird catches the worm- this was sold out not long after. I was hoping to move on to the Old Slug Porter by RCH (slugs being a natural progression from worms) but this had proved popular and so I had to move on. A wander up the row and I find the equally interesting sounding Pressed Rat & Warthog by Triple FFF– a 3.8% Mild. The colour was a delight- a deep ruby red that glowed when the light hit it- an absolute stunner to look at. Toffee and chocolate dominated the nose with a satisfying palate of chewy dates, chocolate and blackcurrent sweetness filling the mouth and vying with heavily roasted malt notes. An incredibly long, dry and bitter hopped finish wrestles its way to the fore but the sticky sweetness continued to try and get through. A very complex and satisfying beer for its low abv. Next was a wander to the Sussex bar- one of the reasons the Hove Town Hall works so well as a venue for this festival is the use of the multi-storey floor plan to spread it all over, with beer and food hiding around different corners and on different levels, it’s nice to move around and hunt for the brews! My fourth beer was more of an impulse buy. I had intended to sample the Kissingate offerings but these had proved so popular that they were off already, turning to my left I saw the beacon that is Harvey’s. A name that’s synonymous with quality beers, so asked for a third of their (Royal) Elizabethan, a 7.4% Barley Wine. Not my wisest choice in the sense that I was only half-way through my session and this probably should’ve been saved for the end but in terms of flavour it was an excellent choice. Huge, huge flavours exploding with zingy sweetness from apples, raisins and sultanas then a mild yet transient spice sneaks in but is edged out by biscuity malts and maple syrup. Initially very sweet but mellows and warms with every mouthful. A huge, complex ale that is a slow supper yet dangerously drinkable. This was from the batch initiated by Her Majesty on her visit to the brewery last November, hence the (Royal) in the beers title. The strength of this probably screwed my palate for the next half but I continued my exploration and remaining in the Sussex bar I eyed up the Dark Star & Saltaire collaboration- Bock. A rich, dark brown, 5.6% brew with a light edge. There were chewy salted caramel and hazelnut flavours going on with this, brown sugar also vying for attention with enough bitterness to keep it crisp, balanced and very drinkable. This didn’t last very long at all. 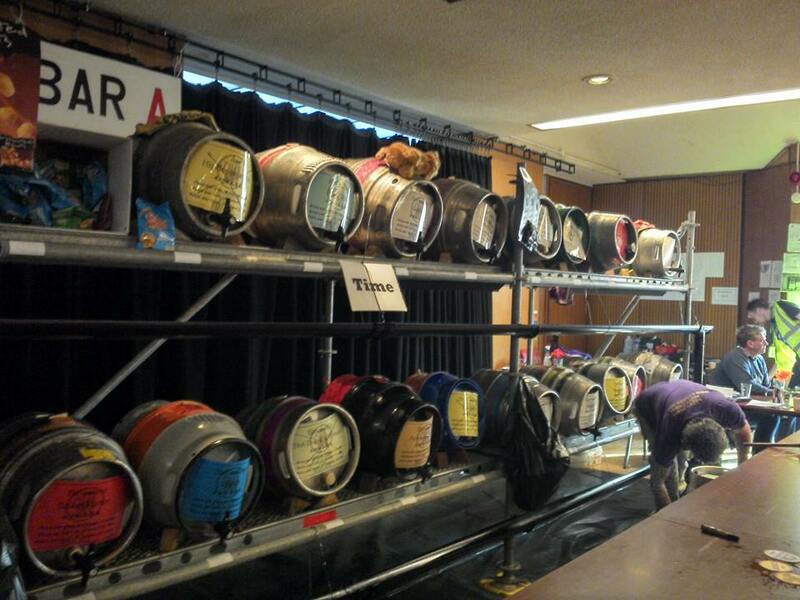 I made my way back to the Main Hall and on a recommendation opted for a Brown Cow by Milk Street brewery of Frome. A much needed lower abv that I probably should’ve had earlier on the session. A very pleasant nut-brown ale with the spotlight shining on its malts- lots of biscuit and nuttiness with a light, hopped edge. Very drinkable session brew. I started wanting more of Black Jesus (insert your own joke here) but many a disciple had followed and I wasn’t able to get my mitts on anymore so staying in the region I cast my eye over to Kelham Island and chose their 5.5% Bete Noir. Described as a ‘high-risk stout’ this ooozed dark chocolate that coated the palate with deeply roasted malts and bitter, strong espresso shots in a velvety rich offering with bursts of current sweetness and a dry finish. Speaking of finish, I had enough tokens left to end on a third of Late Knights’ Frosty Morning– a big bitter that packs the right punches. An earthy, caramel nose and again on the palate- chewy caramel and earthiness or woody-ness with citrus pith, marmalade and a pinch of spice- cinnamon p’haps. A very dapper bitter for the colder evening. And as the afternoon drew on, just as Christmas does, the day ended as quickly as it had arrived. The anticipation had built, I had my fill of some fantastic brews and Time was called- I joined a conga line and shimmied my way out of the old Town Hall. 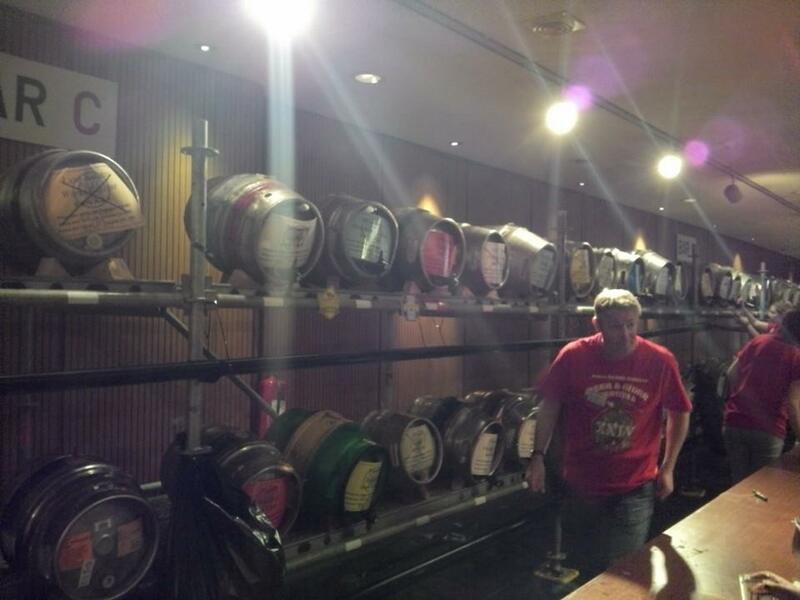 It has been rumoured that it was to be the last year as the venue – a rumour I hope doesn’t come to fruition but nevertheless, anticipation has already begun for the 25th Sussex Beer Festival. Big thank-yous and congratualtions to all the staff, volunteers and brewers for a fantastic festival. See you next year! Founder and Editor of Look At Brew - a beer blog dedicated to the celebration and promotion of the modern beer scene. Contributor to Beer Imbiber magazine, Regional Coordinator for the Sussex Tryanuary campaign and founder of the Sussex Bottle Share. The Tesco Beer Aisle: It’s a love-hate thing.